Sorry, I know it's been a while - Peggy keeps reminding me! I have been busy - a bit of quilting, a bit of travelling, a lot more work and suddenly I realise it's a couple of months since I've posted. In between times I've been ditch stitching this quilt - a real favourite of mine. For those of you who might not know, back in 2009 I owned a Patchwork shop with my friend Peggy (which we closed in 2012) - Peggy and Bev's Place. For fun, we decided to invite our friends and customers to join us in a mystery we called the White Elephant Swap. The rules were simple, no-one was told or shown the design until the day of the swap only that if you wanted to join in you would need 28 fat quarters to make the quilt, 14 dark & 14 lights. Further, we then asked all participants to choose 7 each of their darks and lights and package them in 2 brown paper parcels marked either light or dark which were then swapped randomly. 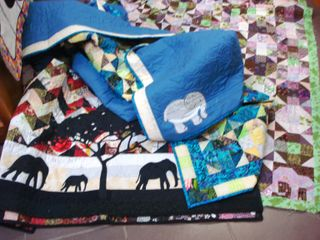 Whatever fabrics you received in the swap must be used in the quilt and finally, somewhere in the design you had to incorporate an elephant. What a leap of faith. It surprised me that not many joined in, in fact most of our friends decided not to participate giving lots of reasons but mostly I think because they weren't comfortable with the uncertainty not knowing beforehand what the pattern was to be, and not able to trust that all that was required to consider was whether the fabric was light or dark. It really was a great exercise. Peggy chose well when she decided on the design as it simply worked! 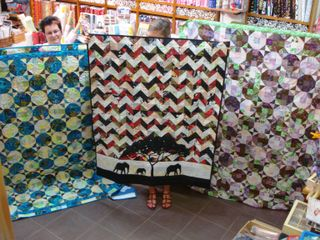 In the end we only had 7 participants and to my knowledge only three of us have completed our quilts, so far. This is mine and it really is special to me. (I admit that I was one of the doubters, but I decided to go along anyway). The lunch when we swapped our packages and the pattern was revealed was a very fun occasion - I especially remember my friend Christina who had decided to make hers in just blacks and whites, she loved the fabrics she'd chosen and decided to hide the parcel in a special place so no-one could get them! Being the multi-talented lady she is, she did eventually relent and the exchange was made. Peggy received what I considered to be some especially ugly fabrics in the swap, but wow she made them work beautifully. Wov, beautiful quilt! Especially I like the colours, purple and green are just perfect together!! !